Nearly two-thirds of the speed cameras in France were out of service by the end of last year, yet the nation enjoyed the safest year ever on its roads in 2018. The traffic death toll for the year was 3503 in throughout the country and its overseas territories -- a 5 percent drop from the previous year, according to the provisional numbers released last week by the road safety agency ONISR. Hospitalizations were likewise down by 25 percent, and injury accidents fell 5 percent. Advocates of lowered speed limits and increased photo enforcement had warned that vigilante action against speed cameras would have a "blood price" from increased accidents. Monthly figures confirm the numbers held true when the greatest number of cameras were disabled. 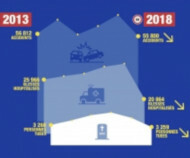 In December 2018, injury accidents declined 1.6 percent compared to December 2017, with fatalities equal at 292, despite the drop in active speed cameras and a reported 268 percent increase in "speeding" at the 80km/h (50 MPH) locations where the cameras were blinded. In November, when the yellow vest protests were at their peak, fatalities dropped 1.8 percent and injuries dipped 4.7 percent. Traffic volume was also up 7 percent over the 2013, which had previously been the safest year on record. Officials desperate to restore the 1.2 billion euros (US $1.4 billion) in speed camera revenue planned for in the national budget have dispatched more road service crews to restore the disabled automated ticketing machines. The private company Satelec-Ineo last week began fixing the speed camera on the D976 in Visan which had been spraypainted and burned. The device has not yet been fully repaired. In the Nord-Pas-de-Calais region, more of the 126 photo radar devices have returned to service. In Les Essarts-le-Roi, vigilantes attempted to set the N10 speed camera on fire, but firefighters arrived on the scene to extinguish the burning tire placed on the device in time to save the radar. About twenty other cameras in the Yvelines department were not so lucky over the past few months. On Friday, vigilantes successfully burned speed cameras in Veauche, Cuzieu, Montrond-les-Bains and La Versanne. On Thursday, the speed cameras on the RD83 in Rouffach and the RN83 in Ostheim went up in flames. In Abbeville, green fluorescent paint was used to blind the speed camera on the D40.